We’d love your help. Let us know what’s wrong with this preview of The Specific Ocean by Kyo Maclear. To ask other readers questions about The Specific Ocean, please sign up. I am a pretty enthusiastic fan of Kyo Maclear's children's books. I was sure her earlier books–Julia, Child and Virginia Wolf–would be hard to live up to when I read that she had another book in the works. Of course, I was wrong. In The Specific Ocean, a young girl is not excited about spending the summer away from home with her family in a vacation house by the Pacific Ocean. When she finally succumbs to the ocean's charm, she tries to imagine ways to take it back home with her. Kyo's books are I am a pretty enthusiastic fan of Kyo Maclear's children's books. I was sure her earlier books–Julia, Child and Virginia Wolf–would be hard to live up to when I read that she had another book in the works. Of course, I was wrong. A sweet, subtle, lyrical, and pastel-washed story (illustrated by Katty Maurey) about a girl who doesn't want to go on vacation but gradually, eventually, falls in love with the ocean. I read it because I had read her quirkier and a little bit amusing Virginia Wolf; this one is serious and straightforwardly lovely. A young girl doesn't want to leave her city friends to vacation with her family at the Pacific Ocean. She even writes up a moping schedule where she allocates time to watch the dust, play chess by herself and stare at the wall. By the third day she grumpily goes down to the ocean with her family. Over the summer vacation, the young girl's view of the ocean and her moods changes from moping and grumpy to excited and longing. When she returns home, she realizes that "no matter where I am, this spe A young girl doesn't want to leave her city friends to vacation with her family at the Pacific Ocean. She even writes up a moping schedule where she allocates time to watch the dust, play chess by herself and stare at the wall. By the third day she grumpily goes down to the ocean with her family. Over the summer vacation, the young girl's view of the ocean and her moods changes from moping and grumpy to excited and longing. When she returns home, she realizes that "no matter where I am, this specific ocean will be with me." I'm so glad there is room in the world for all kinds of picture books, the snappy funny ones and the ones like this: lyrical, beautiful, full of true feelings. A quiet book, such as The Specific Ocean, can be just as moving, as feeling, and as sensory as a loud or demonstrative book. I have long been a fan of Kyo Maclear; author of terrific picture books like Virginia Wolf, Spork and Julia, Child. In this latest picture book, she has teamed up with Katty Maurey, illustrator of Francis, the Little Fox, whose work reminds me a bit of Giselle Potter, Carson Ellis and Isabelle Arsenault (all incredible artists). There is so much to enjoy with The Specific Ocean- a picture book that I hope gets enjoyed by as many readers as possible. Through Maclear's pitch-perfect verse and Maurey's drawings, the picture book captures: the rolling emotions of being dragged away on holiday as a child; of despairing how to fill vacation days; of then finding joy in something as grand as the Specific (Pacific) ocean; and of falling deeply in love with something bigger than oneself and too majestic to hold captive. The combination of Maclear's unadorned and lulling storytelling voice works so wonderfully here with Maurey's clean illustrations and restrained palette. During my reading of this picture book, I was taken back to my own childhood memories of time at the beach with my parents and how grand and radiant everything- the sand, the waves, the rocks, the crabs- even the seagulls!- seemed to be. Overall, I am enamoured with The Specific Ocean. I can safely say that my love affair with Kyo Maclear's work continues, and that was a pleasure to read another picture book with Katty Maurey's distinctive and evocative illustrative style. I hope to see many more works from both in the future! This sweetly quiet story of a little girl who slowly falls in love with the Pacific Ocean brought me a sense of wonder! At the beginning the girl is reluctant to get in the water, but she gradually comes to love playing in and around the ocean. Her dreamy observations and imaginings around the seaside are just lovely, and bring the reader immediately into the story. You can taste that salt air and feel the waves pulling at your feet! The writing is absolutely brilliant! Every word is tailored per This sweetly quiet story of a little girl who slowly falls in love with the Pacific Ocean brought me a sense of wonder! At the beginning the girl is reluctant to get in the water, but she gradually comes to love playing in and around the ocean. Her dreamy observations and imaginings around the seaside are just lovely, and bring the reader immediately into the story. You can taste that salt air and feel the waves pulling at your feet! The writing is absolutely brilliant! Every word is tailored perfectly for that sentence to say exactly what it should, but it never feels forced or like it's trying too hard. Each sentence flows to the next with the rhythm of ocean waves. The words are so rich and vibrant too! "Grumping down the path" perfectly describes a child walking grumpily, even though "grumping" is not actually a word, I think. No matter, because it is just the RIGHT word, whether it exists or not. There are perfect words like that on every page of this book! What a delight it would be to read this book aloud! The sounds of the words roll off the tongue and down the lips like drops of water splashing off a wave... "Shine, shimmer, gleam, glow..." and with four words, I can see the seashore in my mind's eye. I love that the girl mistakenly calls it the "specific ocean" instead of the "pacific ocean", but decides that the former name is more appropriate after all. I have heard kids say it wrong all the time, so it rings true and touches my heart. Details like that are what make this book so special! The illustrations fit the story like a glove. Calming colors and smooth lines leave me feeling soothed and dreamy. Warmth and light shine from every page! There is magic in this book! Undeniably, this is a masterpiece of children's literature. I'm not the slightest bit surprised that Kyo Maclear's latest is marvelous. One need only take a look at Virginia Wolf and Julia, Child to know that her work is utterly darling. But The Specific Ocean is especially great, a meditative story about learning to love the ocean over the course of a summer vacation. It feels like a child-sized version of This One Summer, tone-wise. Maclear teases out delicate feelings over the course of the book and presents refreshingly mature, nuanced views of owners I'm not the slightest bit surprised that Kyo Maclear's latest is marvelous. One need only take a look at Virginia Wolf and Julia, Child to know that her work is utterly darling. But The Specific Ocean is especially great, a meditative story about learning to love the ocean over the course of a summer vacation. girl, held for decades and told now, with the wisdom of an adult and the sense of wonder of a child. The art is as lovely as it ever is in Maclear's books; her publishers always seem to match her up with the perfect illustrators. One more I highly recommend adding to any bookshelf. The Specific Ocean follows the simple but endearing story of a young girl who goes on vacation on the Pacific Ocean. As the story unfolds, her initial indifference to the ocean turns to a growing fondness as she discovers its hidden beauties. In terms of plot, you could say that there isn't much happening, but there also lies the charm of this simple but poetic book. 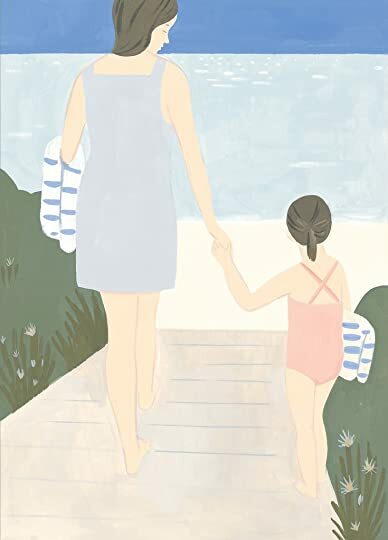 Within slightly more than 30 pages, the gorgeous illustrations and the lyrical prose offers a story that will leave the reader wit The Specific Ocean follows the simple but endearing story of a young girl who goes on vacation on the Pacific Ocean. As the story unfolds, her initial indifference to the ocean turns to a growing fondness as she discovers its hidden beauties. In terms of plot, you could say that there isn't much happening, but there also lies the charm of this simple but poetic book. Within slightly more than 30 pages, the gorgeous illustrations and the lyrical prose offers a story that will leave the reader with the unique satisfaction that comes from reading memorable stories, along with an unavoidable longing for the cool waters of the ocean. Wow. Predictable in the best possible way. The transformation of the girl's attitude towards the ocean is spellbinding and feels like an accurate portrait of how someone falls in love with something like the ocean. This is a relatively simple story, beautifully told and illustrated. It would be ideal to read on a beach next to a sea or ocean but engenders that feeling even when you’re some distance away. The descriptions are succinct, yet simple and emotive, taking the reader on a journey with the characters. It is easy to empathise with the little girl and to feel how her view of the ocean changes from resentful to love during the course of her holiday. The illustrations are pastel shades but so evocative This is a relatively simple story, beautifully told and illustrated. It would be ideal to read on a beach next to a sea or ocean but engenders that feeling even when you’re some distance away. The descriptions are succinct, yet simple and emotive, taking the reader on a journey with the characters. It is easy to empathise with the little girl and to feel how her view of the ocean changes from resentful to love during the course of her holiday. The illustrations are pastel shades but so evocative enhancing the whole experience. This is a brilliant book and one I have no hesitation at all in highly recommending. Sometimes children resent the holiday plans made for them by their parents. In this enchanting story that is very true for the young girl in the story who would much rather stay in the city with her friends rather than go on holiday to the Pacific Ocean (- when she was younger she thought it was the Specific Ocean until her brother corrected her!) Initially she believes their holiday is boring but, after swimming in the sea with her Mum and brother she starts to experience it in a new way, learning to love the ocean more as each day passes and witnessing its moods, colours and life. Parents and teachers could also use this book to prompt discussions about how sometimes the things we assume we’ll dislike can turn out to be something we really appreciate. It could also reassure wary children that sometimes visiting different places can be a positive experience, that change isn’t necessarily a bad thing. The descriptive language used is inspirational and could be used as a brilliant stimulus for creative writing. The art work throughout the book portrays the emotional attitudes of the characters and the atmosphere of the story superbly making it a great starting point before children explore their own creations. Definitely a book worth making shelf room for, delightful and endearing. A girl does not want to leaver her friends behind in the city and head off for summer vacation. There’s nothing to do in the little house near the ocean that she used to call The Specific Ocean instead of the Pacific. She starts out with a moping schedule and refuses to head to the water. The next day though, she does go down with her family and the water is cold but it also has warm spots. The next day, she races her brother down to the beach. They spend time floating in the waves, walking alon A girl does not want to leaver her friends behind in the city and head off for summer vacation. There’s nothing to do in the little house near the ocean that she used to call The Specific Ocean instead of the Pacific. She starts out with a moping schedule and refuses to head to the water. The next day though, she does go down with her family and the water is cold but it also has warm spots. The next day, she races her brother down to the beach. They spend time floating in the waves, walking along the shoreline, and sitting on the rocks to watch the waves. The girl decides that she wants to have some of the ocean to call her own and to bring home, but that won’t work. So she has to figure out how to take the feeling of it home with her, deep inside. Maclear has written a book about the process of change and the time that it takes to allow new experiences in. Time in the book moves slowly forward, allowing the girl the chance to change her mind in a natural way. Then the connection with nature becomes a delight, a way to spend the long days of vacation. The ocean becomes not just a source of activity for her, but a source of personal peace and joy. That process is honored here, that feeling of being connected to the world as a whole and wanting to keep that feeling with you every day. The prose in this book is exceptional. Maclear writes in first person and allows the girl’s voice to be poetic but still childlike and simple. Maurey’s illustrations are filled with an inner glow that is helped by the pastel palette that is used. The sun shines on the page, the water beckons. The book has that dreamlike quality that many good vacations do, especially those filled with salt water and sand. Quiet story for old souls. Highly recommended for ages 5-7. Received from NetGalley for review. 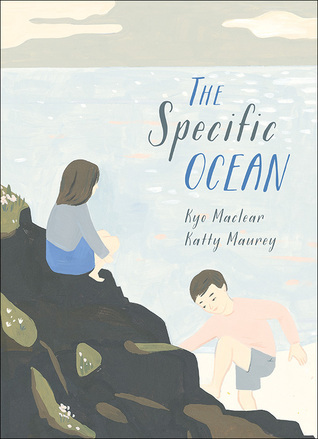 The Specific Ocean is an adorable story for children, about a young girl who goes on holiday to a cabin near the Pacific Ocean with her family. At first she doesn’t want to be there and is convinced it will be a boring holiday, until she reluctantly goes down to the sea with her family and realises how vast and entrancing it can be. The drawings are delightful – utilising a calm palette of blues, gre Received from NetGalley for review. The drawings are delightful – utilising a calm palette of blues, greens, and creams, with flashes of brightness, it is a wonderful thing to look at. The narrative itself is simple but descriptive, creating beautiful images with few words, and I know that adults and children alike will enjoy this during story time. It explores the ocean, with all of its mystery and allure, which will probably spark a lot of interest and beach trips for children – something I highly recommend, having spent half my childhood at the beach. This is a lovely children’s book that will work on many levels – for younger children being read to, and older children who are gaining confidence in their reading ability. It’s a very sweet story and sparks excitement about the ocean, something that not enough people are interested in or care about. I received a copy of this book via Netgalley in exchange for an honest opinion. Wow, this was a gorgeous book, inside and out. I was really, really impressed by the emotion and depth it carried through its story (no, no pun intended that time). At first I was weary to pick a book called 'The Specific Ocean', but I really loved her explanation about it and her idea that there can be something said outloud and something you call it in your head. I do this SO often, so the sentiment shocked me. You c I received a copy of this book via Netgalley in exchange for an honest opinion. You could clearly see the emotions of the young girl, from sad, to bored, to intrigued, to in love, to sad, to bittsweet and hopeful. It was so well illustrated in the gorgegous work. The muted colors make you wish you were right there in the ocean with her. I love that she talks about how her brother actually knows things and builds him up. Many kids books say things like "my stupid brother" or "they think they know everything", but it was a nice little point to show how she cared about what he had to say. The Specific Ocean follows the simple story of a young girl who goes on vacation to a small house the coast of the Pacific Ocean. In the beginning, she does not want to go to the ocean. Her brother and mother try to get her to go down to the beach but she stubbornly refused. The second day her mother takes her by the hand and she reluctantly gets in the water. Each day she falls a little bit more in love with the ocean. As her time there is nearing an end, she asks her brother about taking some The Specific Ocean follows the simple story of a young girl who goes on vacation to a small house the coast of the Pacific Ocean. In the beginning, she does not want to go to the ocean. Her brother and mother try to get her to go down to the beach but she stubbornly refused. The second day her mother takes her by the hand and she reluctantly gets in the water. Each day she falls a little bit more in love with the ocean. As her time there is nearing an end, she asks her brother about taking some of the ocean home with her, but he convinces her that is not a good idea. She realizes that the Specific Ocean will always be with her in her memories. A very simple story about giving something new a chance as well as opening the reader up to the miraculous world under water. The illustrations complement this story with their light, muted colours and simple content. They do not overwhelm and are not `too busy`. A wonderful story for children of all ages as well as adults. “The Specific Ocean” tells of a girl who was reluctant to go on vacation with her family. She did not want to visit the ocean. When she finally was convinced to explore the water and the beach, she came to love it. So much so that she wanted to take the ocean home with her. Realizing she does not need to take the water with her, the girl will always remember the summer spent at the ocean. Have students recall a place that is special to them. Whether it be a place they visited with family “The Specific Ocean” tells of a girl who was reluctant to go on vacation with her family. She did not want to visit the ocean. When she finally was convinced to explore the water and the beach, she came to love it. So much so that she wanted to take the ocean home with her. Realizing she does not need to take the water with her, the girl will always remember the summer spent at the ocean. Have students recall a place that is special to them. Whether it be a place they visited with family, somewhere in their community, or even a spot of their own at home, let students take the time to discuss it with a small group, or share aloud. Once everyone has thought of a place, allow students to write adjectives or onomatopoeia to describe their idea. Depending on the time span for the activity, students could either illustrate or build a small diorama of the place that they described. This book follows a girl who is on a trip to a beach house with her family. She does not like this location, but throughout the book she grows to love and understand how it connects to her life. This book has beautiful scenery and an interesting story of self-understanding. The media in this book is soft water-paint combined with colored pencils. This creates a flowing image in each page and contrasts well with the words for reading. The art in the book is relaxing, as with the writing of the st This book follows a girl who is on a trip to a beach house with her family. She does not like this location, but throughout the book she grows to love and understand how it connects to her life. This book has beautiful scenery and an interesting story of self-understanding. The media in this book is soft water-paint combined with colored pencils. This creates a flowing image in each page and contrasts well with the words for reading. The art in the book is relaxing, as with the writing of the story; this adds to the soft flow of the book. The Specific Ocean is a beautiful book about a girl who slowly comes to love the Ocean. She does not want to leave her city home and friends to go on a vacation to a beach house on the Pacific Ocean. She is dismal when she arrives, saying everything is boring; however once she sets foot in the Ocean, her senses come alive and she cannot let go. With lyrical, but simple beauty, the sense of wonder for the ocean is awakened for a young girl. Through opening your emotions, the sights, smells and so The Specific Ocean is a beautiful book about a girl who slowly comes to love the Ocean. She does not want to leave her city home and friends to go on a vacation to a beach house on the Pacific Ocean. She is dismal when she arrives, saying everything is boring; however once she sets foot in the Ocean, her senses come alive and she cannot let go. With lyrical, but simple beauty, the sense of wonder for the ocean is awakened for a young girl. Through opening your emotions, the sights, smells and sounds of the ocean are brought to life. This book is perfect for opening children up to new discoveries and appreciation for the environment and the world around them. The artwork is in gentle hues that goes perfectly with the memories of the ocean. A great book for any child or child at heart. Though she protests going at first, a girl soon learns to love their Pacific Ocean vacation site and her time there. Calm and peaceful illustrations really work in conveying a peaceful seaside retreat and how that can make someone feel. The story itself isn't anything amazing or new, but it is very relatable. All of us have those times when we're being taken somewhere and we just don't feel it. (One of my sisters went through a period of time as a toddler when she'd chant "I hate to go! I hate to Though she protests going at first, a girl soon learns to love their Pacific Ocean vacation site and her time there. "There is no late or hurry or racing in ocean time." This story follows a little girl who goes on a family vacation to the Pacific Ocean. At first, she is upset, but she slowly comes around and grows to love the Ocean and everything in it. I liked the pacing of the writing. I feel like so many children's books just have made up words jumping out at you from the page. This was mellow and had real writing. I got a similar feeling from the artwork--it was nice and calm and captured the different mood "There is no late or hurry or racing in ocean time." I liked the pacing of the writing. I feel like so many children's books just have made up words jumping out at you from the page. This was mellow and had real writing. I got a similar feeling from the artwork--it was nice and calm and captured the different moods of the little girl. I would recommend this book as I feel like the style and story are a nice change of pace. A city young girl goes on vacation to a small house near the coast of the Pacific Ocean with her family. Leaving her friends behind, she feels sad. In the beginning, she doesn't want to go to the ocean. All of her family members try to get her to go down the beach. But, she refused. But, in the second day, she realized that the ocean can change her perspectives as she begins to fall in love with the ocean. The story can be simple. But, it is supported by the awesome illustration. That's appealing A city young girl goes on vacation to a small house near the coast of the Pacific Ocean with her family. Leaving her friends behind, she feels sad. In the beginning, she doesn't want to go to the ocean. All of her family members try to get her to go down the beach. But, she refused. But, in the second day, she realized that the ocean can change her perspectives as she begins to fall in love with the ocean. I received an electronic copy of this book in return for my honest review. All opinions are my own. This book was beautiful. As a lover of the ocean, this book called out to me. I had to request it. I suspected (and was right!) that this is about the pacific ocean. The detail the author writes with made it feel like I was there. The young girl in this story, who hates being away from the city at it's start, hates it when it's time to leave. The pictures are beautifully done. Very calming. Really I received an electronic copy of this book in return for my honest review. All opinions are my own. This is a quiet book of a girl and the ocean. She was reluctant for the vacation, and gradually fall in love with ocean. Learned that peace and calm. The language used in this book is poetic yet straightforward, just like a friend telling you her experience. True and touching. Love Kyo's book, always have something deep from its face value it presents. The illustration used pastel like palette and minimum strokes. The lines are expressive. Need some work on choosing the right scene for each page This is a quiet book of a girl and the ocean. She was reluctant for the vacation, and gradually fall in love with ocean. Learned that peace and calm. It's amazing how you can almost see the texture of the art that this book contains. It's nearly enough to make it worth checking it out just for that but then you begin to take in the story. The resistance at first but then just giving in to the magic and wonders of the ocean is wonderful to witness. At the beginning I wished the font was a bit different because I enjoy the variety of typography that picture books offer but I think what was chosen ended up fitting the feel of it perfectly. Gorgeou It's amazing how you can almost see the texture of the art that this book contains. It's nearly enough to make it worth checking it out just for that but then you begin to take in the story. The resistance at first but then just giving in to the magic and wonders of the ocean is wonderful to witness. The ocean is a mystery of mysteries. If people ask, I'll tell them the ocean is full of noises. Then I'll tell them that if they listen very carefully, they might even hear the ocean in their own breath. The ocean is so big that it makes every thought and worry I have shrink and scatter. There is no late or hurry or racing in ocean time. The illustrations were beautiful. The text didn't flow well though. The move from ennuie regarding the little girl's seaside visit to captivation is without nuance, To sudden given how deep her resistance is. That said, there are some lovely lines, almost poetic, of young understanding, unjaded views. When a young girl is dreading a vacation by the ocean she soon changes her mind when she plunges in. As she learns about the beauty around her she realizes this one-of-a-kind place is big enough for two names. A great story to share with children age’s four to eight who love to learn about the world. A beautiful, quiet story about a child's vacation at the ocean. At first, she is reluctant to leave her home in the city for the "boring" ocean, but once she arrives she slowly learns to explore and love the Pacific (which she secretly calls "specific") Ocean. I appreciated the subtle narrative about ocean conservancy within the book. Kyo Maclear is a children’s author, novelist and essayist. She was born in London, England and moved to Toronto at the age of four. Kyo is the author of several critically-acclaimed children’s books including: Spork (2010) and Virginia Wolf (2012), both illustrated by Isabelle Arsenault; Mr. Flux (2013), illustrated by Matte Stephens; Julia, Child (2014), illustrated by Julie Morstad; The Specific Kyo Maclear is a children’s author, novelist and essayist. She was born in London, England and moved to Toronto at the age of four. Kyo is the author of several critically-acclaimed children’s books including: Spork (2010) and Virginia Wolf (2012), both illustrated by Isabelle Arsenault; Mr. Flux (2013), illustrated by Matte Stephens; Julia, Child (2014), illustrated by Julie Morstad; The Specific Ocean (2015) with Katty Maurey; The Good Little Book (2015) with Marion Arbona; The Liszts (2016) with Júlia Sardà; The Wish Tree (2016) with Chris Turnham; The Fog (2017) with Kenard Pak; Yak and Dove (2017) with Esmé Shapiro; and Bloom: A Story of Fashion Designer Elsa Schiaparelli (2018) with Julie Morstad. Her newest books are Operatic (2019), illustrated by Byron Eggenschwiler; and It Began with a Page: How Gyo Fujikawa Drew the Way (2019), illustrated by Julie Morstad (2018) . Kyo's non-fiction book Birds Art Life follows two artists on a yearlong adventure to find birds in a big city. It is an intimate and exuberant meditation on creativity and life—a field guide to things small and significant. She is also the author of two novels: The Letter Opener (2007) and Stray Love (2012). Her essays and art criticism have been widely published and anthologized in North America, Europe and Asia/Australia.